The case for Third Front in Indian politics! The political challenges and opportunities! We need new ideological articulations! So many distortions, so many contradictions! Democracy faces the dangers of a mobocracy! Even the political class seems driven by selfishness and greed! See even the ministers and their kin have indulged in large scale corruption and corrupt deals! Many cases are knocking at the doors of Minister, even the top leaders’ doors! Third Front comes out of political compulsions, also through people’s aspirations and peoples’ frustrations! Unprecedented corruption, 10 year low economic growth, high food inflation and dynastic politics and also BJP’s ultra-right-wing turn a mature India to seek new paths. Leadership, vision and a robust belief in India’s destiny could turn the tide! A Historic Opportunity! There are certain ominous signs that don’t portend well for India! What chances for the Congress and the BJP parties? What chances for the Third Front alternative? 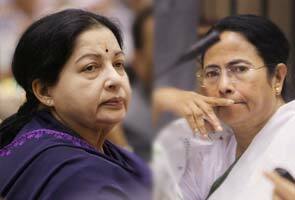 Mamata Banerjee, Nitish Kumar and Naveen Patnaik come together? What about others, Jayalalitha, Mulayam Singh Yadav, Mayawati and Chandrababu Naidu? Just today, Thursday, 13, 2013 The Economic Times carries the news of Nitish Kumar wants to break off from the NDA and sent his emissary to Mamata Banerjee who, unexpectedly came out openly for a federal front against the two major parties. Is this any good news or as it is predicted by vested interests just a pipe dream? Now, what is to be noted is that India is a difficult country politically. Why? As I type these lines the TV images flashed before me are the latest Maoists attack on the running train near Patna in Bihar! Below the surface in the rest of the country too there are signs that point to an unprincipled coalition politics that is also not good. Democracy seems very false today. There is every chance, likely to be triggered by many dark forces, that might pull down the formal walls, for innocents like me (!) look like awesome Roman Wall in the Roman Forum. But put simply, we are triggering a mobocracy with our populist schemes, pushed through not even after a Parliamentary debate as much by a hasty ordinance just to gain an electoral advantage. An unfair advantage at that! All this you do in the face of mounting evidence and developments that pout you squarely in the dock. So much corrupt deals, instead of unearthed, you do everything in your power to cover up. People are watching you! You who have no roots, no grassroots surely, but all perched so uncertainly on kurshis and pretenses.These signs are not for good. They point to some developing story of change, fundamental tremors. In a democracy, please understand the popular feelings and discontent. As Prof. Deepankar Gupta writes in a column that India and Indian democracy in particular has developed or thrown up some taboos that certain topics, certain names like about a political family you can’t talk openly. So, in India we see the real and basic changes in our polity are taking place without any media attention or public appreciation. One story today I read about is about the six warriors, yes they are warriors, the six ordinary citizens, namely are worth remembering, Subash Aggraval, Anil Biarwal, Ashok Aneja, Manoj Kumar, Hemant Bisht, Shivani Kapoor. The six got together and they individually and collectively got the Central Information Commission (CIC) to give a ruling that the political parties come under the Right to Information Act. This is a major victory for the Indian democracy but somehow, Indian democracy is now getting reduced to a joke, if such a word is the right one, and we see, as I mentioned in the very same day we find certain news that are basic and yet the media, perhaps under the same pressure of threat or taboo considerations, the average citizen is not given any enlightenment. One news item is about the CBI getting “permission” to question the PM’s advisor, the long-time retired and yet retained by the PM for his possible role in the Coalgate scam! Another is the secretary of the coal dept. when the PM was the minister in charge. Other two officials in the PMO. What is left unsaid and also unasked is the role of the PMO or the PM himself! In India today to question the PM, even under our democratic cover, is next to impossible. It is a taboo! There is another news item. This time it is about the Congress party President’s own son-in-law. Says Deepankar Gupta in the same column. The word “R” is another taboo in India! The point is that Indian democracy has become shrunken over the years that today to mention any one’s name, even if he or she is a public figure is next to nothing! Can you go to W.Bengal and talk about the CM freely. Can you do the same in TN? Or about the Dravidian leaders, even the minor ones? You can’t. You will do so only at your own peril! The tragedy is that today in India there is not much democratic space and there is practically any freedom of the individual that you can’t openly discuss even issues of public interest. There is also a near one-page write-up on a central minister, Mr.Rajiv Shukla. A minister. It is a very interesting piece.He came to Delhi in 1983 as an ordinary journalist and today he is a multi-millionaire, crorepathi. He rubs shoulders with Mukesh Ambani and Sharuk Khan! Own so many businesses. The point is that neither Sonia Gandhi nor Manmohan Singh seems to be bothered with any big things happening. As I write the Maoists have attacked a running train ear Patna, some causalities reported. This just after the funeral of one victim, a former central minister, after 20 days when the very same Maoists killed 29 persons, all leaders in Chhatisgarh jungle. What are the thoughts of the big leaders, big thinkers and others? This what Prof.Gupta is meaning when he says that any polity, be a dictatorship or a democracy, when the public feelings, voices and free thoughts are forbidden, then what it leads to? Oh, history is full of forebodings.I had read the many revolutions. More in particular, the detailed writings on the 1789 revolution in Paris, Versailles. Also, when I visited Versailles I checked with the guide or guides the very route the first batch of protestors took to reach Versailles and also the staircase through which they climbed to the chamber of the Queen and what happened afterwards. It looks that all great revolutions seem to start unobtrusively and only when things get out of control and when bloodshed and killing reaches some gruesome proportions we call them as revolutions. The same thing when see such events like the 1799 Tipu Fal. He was caught off hand when the traitors breached the Watergate and entered the fort walls. He was caught off hand and it was at first a one-to-one fight. Robert Clive at Arcot in 1751. In the instance case of Indian elections in the next few months what we see? It depends who asks and who answers! If you are an enthusiastic party loyalist (are there any true loyalists these days in any party? )then you might keep silent or repeat the voice of the masters.As far as I can see (as a long-time Congressman of the old school) there is no one inside the Congress party toward either the PM or the Party President. If she and the PM are really committed they would realise that to rush the food security bill and also the land acquisition bill though an ordinance is foolhardy in the first place.It is like saying as Mary Antonitte said of the people eating the cake when they just wanted bread! There is enough food storks, something like 77 million tonnes, the minimums stock needed is just something like some 40 million tonnes. There is such poor governance at many levels, that the food inflation is an unacceptable 16%! So, when people are agitated over the mundane issues like price rice, unemployment and bad governance, you rush through an ordinance! Is this an ordinance raj? Or an Emergency Declaration? You don’t care or willing to persuade the Opposition parties.Nor are you sure of your calibre to participate in Parliamentary debate! So, even without the Third Front fructifying, the Congress might be ousted, as it seems from all points of view. Who knows, even before the elections the Supreme Court may say something that might make the PM’s position impossible and he might have to go. 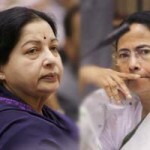 The tragedy is that it is not Nitish Kumar or Mamata or Jayalalitha are itching for the job of the Prime Minister.It is the very logic of politics, the political history of nations and regimes that some other intervening force comes in and the government falls. The point here I want to convey to the leaders of the Third Front, to Mr.Nitish Kumar, Mamata Banerjee and Naveen Patnaik and even Mulayam Singh Yadav and Mayawati is that it is the very logic of the political realities in India that they have to come together to face the two evils, two major parties whose own international contradictions in themselves makes for these leaders unwilling to line up with either one of the parties. Surely, the Indian citizen is already sensitised, thanks to such civil society agitations and movements by men like Anna Hazare and Arvind Kejriwals and many other civil society leaders that we, as citizens and others, be they from other walks of life, we as a people have to think and give an ideological and philosophical meaning to do what we intend to do. India is a very diverse and multi-party and multi-ethnic democracy. So, secularism, democracy, transparency, openess and a vision to give a broader canvass to the 127 year old Congress party and ideology a reasonable justification to seek votes and support. Ignorance or perhaps sheer unsuitability of persons like our leaders have made their positions untenable. Otherwise how such large-scale corruption can can come to thrive just around the neck of the leaders? Surely, the country would also realise that it is time for Sonia Gandhi to give way for more democratically chosen leader of some substance and stature. So too for the BJP. How can Narendra Modi can imagine he can lead India? It is too big a task for his narrow focus to grab power and seek glory. BJP has to change radically. It has to become a middle-road party at best. There can be only two combinations, Centreist-RIght or Centralist Left. There can be minor variations. Yes, private sector capitalism is now inevitable. But then what we see today is cronyism at its worst forms. You have to have some basic principles untouched. Now, you are violating them every day. Bring in more reforms, we mean political reforms. Too many money-making, corruption-prone ministers now adorn the gaddy.Too many clever lawyers are distorting some time-honoured values like truth, honesty and credibility. Now, winning an election seems a child play. Packing the Rajya Sabha would only accentuate the tensions and greed for power. So, the Third Front has a logic and its time seems to have come. Let us give an honest try. Politics is the art of the possible. Time and tide wait for nobody. So, let us play our part, citizens and various players.